The public transportation info found in Google Maps is about to display real-time for San Francisco, Chicago, Seattle, Budapest, Netherlands and the UK. 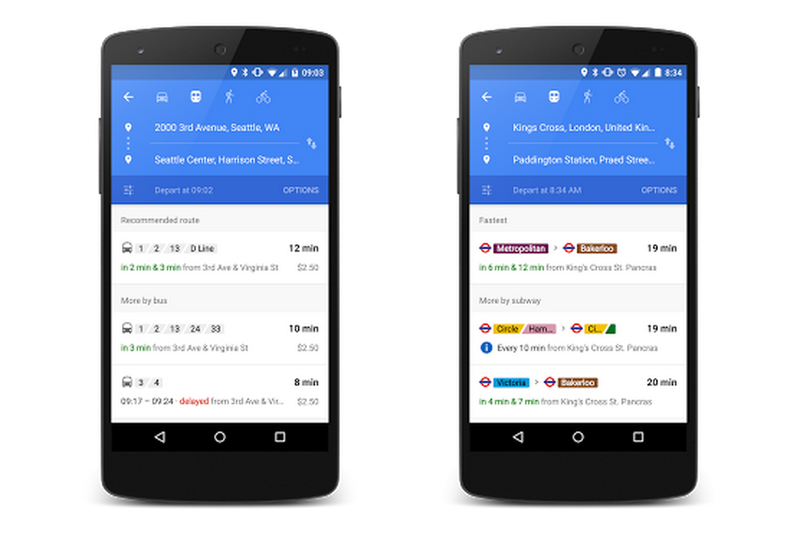 Google Maps will show you info like whether a bus is running late, or a train is ahead of schedule. To accomplish this, Google has partnered with over 6,000 transit authorities to get a current view of where their vehicles are. For all Maps users, public transit options will now be lumped into groups when you plan a route. If the subway line you wanted to take was behind schedule, Maps now makes it easier to find a different subway route that might get you there on time. Google says Maps public transportation info now serves over 18,000 cities in 64 countries, and has over 2.5 million train stations, bus stops and ferry terminals listed.